s a Bronx teen in the ‘60s, a number of my friends and I were vendors at YankeeStadium. One of my friends, Frank, was not much interested in vendoring at the Stadium, as the pay was not salaried, but was instead by commission only. The Yankees were in a downslide during that period and their crowds were dwindling. Small crowds adversely affected vendor sales and commissions. But one summer, Frank began having a problem finding a job that paid a salary, so he swallowed hard and applied to be a Yankee Stadium vendor. Frank’s very first day as a Yankee Stadium vendor was on a Sunday, when the Yanks, down in the standings, were playing a doubleheader against another team that was also down in the standings. Worse still, it was hot, humid, and drizzling. The result was a scant crowd. Frank’s product assignment was scorecards and pencils and his territory was the upper grandstand. At that time, scorecards and pencils were each selling for twenty-five cents. Generally, the rule when assigned scorecards and pencils at a doubleheader was that the vendor would sell them through the first three innings and then be switched to a food product for the rest of the doubleheader. Food products and souvenirs were higher-priced items and hence returned higher vendor commissions. Because this was Frank’s first day vendoring, he was among those chosen to first sell the lower-priced scorecards and pencils before being switched to a food product or souvenirs. One’s territory was also an indicator of how a vendor might fare; that is, sales were brisker and thus commissions were higher where the seats were more expensive, as those fans presumably were “bigger sports” with their money. While Frank didn’t have the territory with the highest-priced seats, it could have been worse had his territory been the bleachers, the lowest-priced seats. Obviously, the only place a fan could get a scorecard was at the Stadium; it was not something that they had at home that they could bring into the Stadium with them. But a pencil was something different. 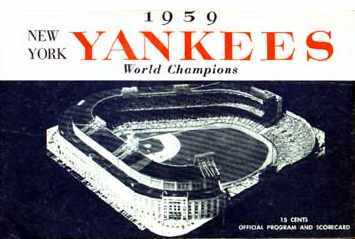 Fans did not need to buy a pencil at Yankee Stadium for twenty-five cents when they could easily bring a pencil or pen into the Stadium from home at no cost. Overwhelmingly, that is exactly what fans did who bought a scorecard at the Stadium. They bought only the scorecard and used a pencil or pen brought in from home. Frank began selling scorecards and pencils about thirty minutes before start of the first game. Given the small crowd size, scorecard sales were minimal, and pencil sales were for all intents and purposes nil. As time marched on to the start of the first game and then through the first three innings, scorecard sales had improved only to where Frank had sold out of the stock he had started out with. In better times, that stock might have had to be replenished three times by the third inning. But the worse news was that Frank had nary a pencil sold. Inning three ended and Frank returned to the storeroom from which stock of product was dispensed and replenished by an attendant, to be switched to a food product. In the Stadium’s concession hierarchy, the storeroom attendants had power over the vendors, if for no other reason than they were adults, while the vendors were mainly teens. Most of the attendants were not reputable types. They were allowed some food loss from their storeroom, and many of them would liberally help themselves to cans of beer. It wasn’t far into a game when they were three sheets to the wind. The second game ended and Frank had sold no more pencils than what he had sold through the third inning of the first game. Frank’s commission for that day was negligible and further diminished by the cost of the subway ride to the Stadium and back home. That night, I told my dad what had happened to Frank. My dad, who was self-employed and responsible for drumming up his own business, said that Frank had the wrong technique – that when someone signaled to Frank that they wanted a scorecard, Frank should have handed them both a scorecard and pencil and said “fifty cents, please.” Some might have refused the pencil, in which case Frank would have taken back the pencil and re-adjusted the price to twenty-five cents, but many might have assumed the scorecard and pencil were a package deal and paid the price without giving it a second thought. After Frank’s doubleheader debacle, he never returned to Yankee Stadium as a vendor. Whether or not my dad’s technique would have in fact worked, we’ll never know. Frank landed a summer job soon after as a delivery boy for a local butcher that was not only salaried, but also included tips he received from the customers. In fact, Frank probably made more money that summer than did we Yankee Stadium vendors. I’d say that Frank deserved it after his losing doubleheader.